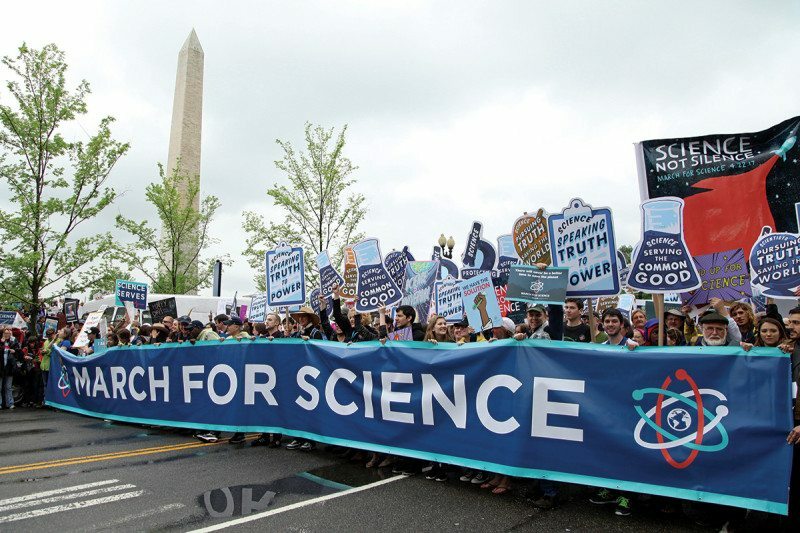 It's time to report on March for Science 2018. While it wasn't as big as last year, there was still a good turnout. One of the sponsors, The Nature Conservancy depicted the demonstration in Washington, D.C.
We were a proud sponsor of this year’s March for Science on April 14th. Here’s a look at the Washington, DC march. New Scientist posted a montage with images from several locations. The March for Science returned on 14 April with rallies around the globe in support of science-based policies. That was a good street-level view of the march itself. Follow over the jump for video reports from New York and California. WPIX reported Hundreds attend NYC March For Science. Hundreds marched in NYC to protect the role of science in society. Note that The Nature Conservancy played a role in this protest, too. Jumping to the other coast, CBS Los Angeles broadcast and uploaded Calls For Evidence-Based Policies At March For Science. Major marches in downtown L.A. and hundreds of other cities around the world all promoted science today. People at these rallies are calling for science to play a bigger role in deciding big issues like guns and immigration. Joy Benedict was at today's rally downtown. Glad to see people in my old hometown marching in support of science. The final report from KCRA in Sacramento showed a combined March for Science and Tax March: Thousands assemble for 2nd March for Science in Sacramento. On Saturday, March for Science Sacramento (MFSS) drew thousands of people to the Capitol steps for a rally and march in support of fact-based policy and robust government support for research and education in science and math. "What the government does should be based on facts, not opinions," said Wes Samms, lead organizer for MFSS. "Whether it's climate change, gun control, or health care, our government is making decisions which go against the facts and sensible policy. This march is about people standing up for science and the truth." MFSS is a volunteer-run group, which successfully coordinated a 12,000-person event in Sacramento last year. The event included a rally where scientists and environmental activists spoke on a variety of issues. By combining the two, Sacramento may have had the largest crowd for either. I plan on posting about the Tax Day protest in West Palm Beach, Florida, home of Mar-a-Lago, tomorrow. Stay tuned.